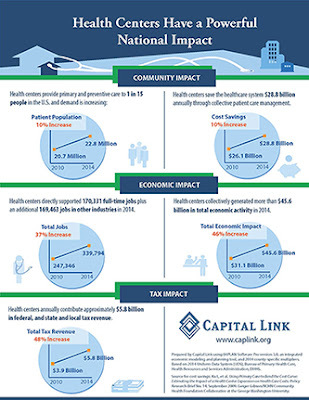 In order to illustrate the most current economic effects of health centers across the nation, Capital Link has updated the national Economic Impact Analysis to include the latest Uniform Data System data (2014). Results show that health centers collectively generated more than $45.6 billion in total economic activity for their local communities in 2014 – a 46% increase since 2010. Health centers also directly supported over170,000 full-time jobs plus an additional 169,000 jobs in other industries, a 37% increase from 2010. Download a copy of the updated infographic here. Capital Link also offers customized statewide and individual Economic Impact Analyses (EIAs). In the past, health centers have used EIAs to educate policymakers, seek community support, and pursue funding opportunities (click here to read specific examples). For more information on EIAs, please visit our website or contact Steve Rubman, Director of Data & Information Systems, at srubman@caplink.org.